. 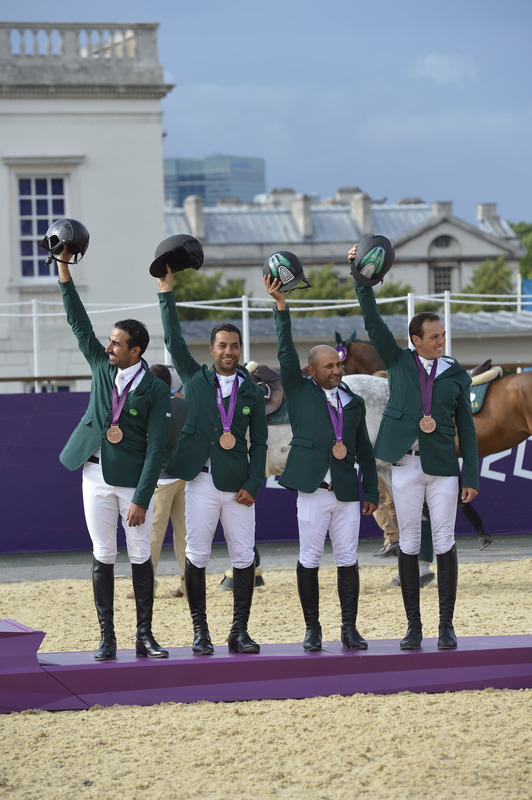 :: SAUDI ARABIA SECURES HISTORIC FIRST TEAM MEDAL - LONDON 2012 OLYMPIC SHOW JUMPING ::. On a tough technical course that featured 13 obstacles, the Saudi Equestrian team of HRH Prince Abdullah bin Miteb Al Saud, Kamal Bahamdan, Ramzy Al Duhami and Abdullah Al Sharbatly, went into the history books as the first Arab riders to ever win a team medal at an Olympic Games for the Kingdom. HRH Prince Abdullah bin Miteb Al Saud riding Davos was the first of the team to tackle the tough technical course, and following two flawless rounds on the previous two days, was unlucky to come away with four faults. Kamal Bahamdan riding Noblesse des Tess, followed shortly afterwards, and he too had one fence down plus a time fault to record a total of five faults.